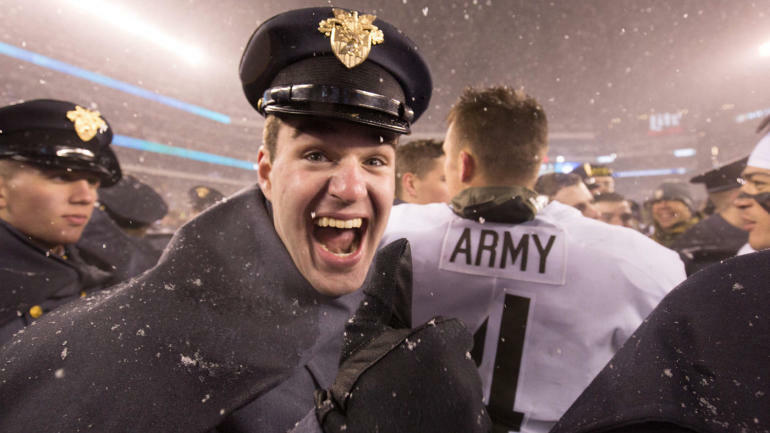 There may not be a better representation of college football matters so much to so many than the annual Army vs. Navy game. It is a matchup rich with tradition and a rivalry that stands the test of time. The first showdown on the gridiron between these two service academies took place in 1890, with Army winning 32-16. They wouldn’t meet again until 1899. They played 30 times between then and 1927, and have played every season since 1930; even during World War II. Over that time the series has been split pretty evenly, with Navy holding a 60-51-7 advantage. Both teams tend to dominate in spurts, with Navy recently winning 14 straight between 2002 and 2015. The Knights put an end to that streak — the longest winning streak by either team in series history — in 2016 with a 21-17 win and followed it up last season with a thrilling 14-13 victory. Will history repeat itself, or will Navy get back in the winning column against its biggest rival? Let’s break the game down and make a prediction on the outcome, against-the-spread, of course. But first, a reminder: The 2018 Army-Navy Game will air live nationally on CBS and stream live on CBSSports.com, the CBS Sports App and fuboTV (try for free) beginning at 3 p.m. ET on Saturday. It’s been a tale of two very different seasons for Army and Navy in 2018. Army enters this game with a record of 9-2, with its only two losses coming to Duke in the season opener and an overtime loss to Oklahoma. Yes, that’s right, Army nearly beat a team that reached the College Football Playoff. With a win against Navy, the Knights will not only retain the Commander-in-Chief’s trophy, but they’ll win 10 games in a season for the second year in a row, something the Knights have never done before. Their only other 10-win season in history came in 1996. As for Navy, it’s been a rough season, but one the Midshipmen are hoping ends on a high note. They enter this game with a record of 3-9, meaning that no matter what happens, 2018 will be Navy’s first losing season since 2011, and only the second of Ken Niumatalolo’s tenure as captain of the ship. Army will win if … It sticks to the gameplan and takes care of the football. Army has only lost four fumbles this season, which is something of a miracle considering it’s an option team pitching the ball with regularity, but it’s the second season in a row the Knights have only lost four fumbles. More often than not, the team that does the better job taking care of the football wins this game. Navy will win if … Like Army, Navy will need to take care of the football. Unlike Army, Navy’s turned the ball over more often, as its lost 10 fumbles. Aside from that, though, the key for Navy will be finding ways to make big plays on offense. Whether it’s on the ground or through the air, Navy will need to find success with explosion plays to pull off the upset.